In a previous article “A New Egypt and Israel’s Border Distraction” published on the 4th of September, I argued that Egyptians should not fall prey to the growing anti-Israeli sentiment. I explained that while I believed the anger on the street was legitimate it threatens to derail the primary objectives of Tahrir, and that Egyptians should focus their protests on ensuring their democratic demands are delivered. Exactly five days later, news bulletins around the world were broadcasting images of angry Egyptian protesters destroying a wall that surrounded the Israeli embassy building. The mob later broke into the embassy, forcing the Israeli ambassador and senior diplomats to evacuate the country. That night saw violent clashes with the police in the vicinity of the Israeli embassy. Sadly, the protests that had started in response to the killing of six Egyptian border patrol officers resulted in the death of three protesters and the injury of over a thousand others. The next morning the ruling army council (SCAF) announced that they were expanding a state of emergency and significantly limiting civil liberties. The army promised that it will use “all means necessary” to quell further chaos and restore public order. Graffiti, written on the remains of the embassy wall, read “I wish to go and free Al-Quds now”, and “The road to Palestine starts from Tahrir”. Ironically, however, the embassy breach may have done more harm to the Palestinian cause than the protesters would have ever intended. But the anti-Israel rhetoric wasn’t confined to the embassy incident. Yesterday, Turkish PM Recep Tayyip Erdogan arrived in Cairo to cheers of Egyptian fans for his bold stance against Israel. His visit was aimed at establishing a Turkish-Egyptian strategic council and increasing Israel’s regional isolation. “Israel must respect human rights and act as a normal country and then it will be liberated from its isolation,” Erdogan said to the applause of his Egyptian audience. So while it may be arguable whether the embassy protests will affect the chances of the Palestinian bid, it has certainly harmed our revolution. If anything, these events highlight the complexity of regional politics and of the the Israeli problem in particular. It underscores that the Palestinian problem will not be solved from the streets but is better served when Egyptians are free. As such I reiterate my call to Egyptian activists to continue pressing for their legitimate rights, only then will the country be theirs. In my opinion, it would be best to play down the anti-Israeli rhetoric and focus on what matters most, our freedom. I think there is an unspoken assumption in this article that having the moral high-ground matters when dealing with Israel – as if good behaviour would some how be rewarded. History doesn’t support that position. Thanks for your comment. You highlight a very important point, since both my articles about Israel have been misperceived by some as advocating an ethical position or as you put it keeping the moral high-ground. That isn’t true. I am all in support of continued protests as well as other forms of civil disobedience that focus on democratic demands. The demonstration in Tahrir last Friday in which protesters requested a set of demands and a timetable for transition to civil rule, is what I think Egypt needs most. Egypt has a weak interim government with a powerful counter-revolution, financed by regional sponsors (Arab) that would prefer to contain the revolutionary spirit and make an example of January 25. Egypt has no parliament, no president and infantile political and civil societies. In my opinion, this is no time to get engaged with the Israeli problem. I say: demand civil liberties, ensure a specific timetable for the transition of power and once you’ve established a government that is remotely representative of the voice on the street one could revisit the Israeli issue within the context of national interests. In my view, its the anti-Israeli protesters that are taking an ethical position when they should be making more pragmatic choices. 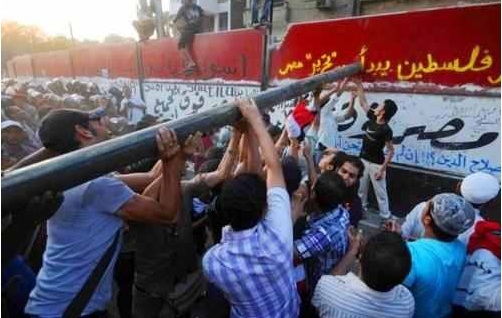 So the protests, strikes in Egypt must go on but the anti-Israeli rhetoric / escalation is a costly distraction. Not only has it harmed the Palestinian cause, it has harmed our cause for freedom. That’s what happens when you spread yourself too thin: you’re neither effective and your bound to loose the support of someone (more someones than the populist hooligans can actually imagine).